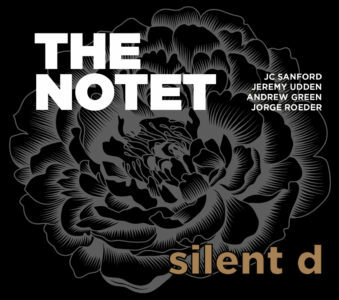 The NOTET is a musical collective organized by guitarist Andrew Green, featuring alto saxophonist Jeremy Udden, trombonist JC Sanford and bassist Jorge Roeder. The group ethos is reflected in the name: no drums, no arrangements, no planning, no rehearsals, no clichés, no edits. Spontaneous and unplanned, ears open and willing and able to adapt at a moment’s notice, the players consistently bring fresh ideas to familiar material, and bring collective improvisation to the forefront. The session features three well known standards, Stella By Starlight, Body and Soul, and the Dietz,Schwarz composition Alone Together. In other, less capable hands, such familiar material might come across as pedestrian, but the level of group interplay is at it’s highest on these tracks, and they definitely sound fresh and unclichéd. The Benny Golson chestnut Along Came Betty is taken at ballad tempo, allowing the unusual harmonic structure to really have space to breathe, and the vibe the group creates is thick and dreamlike.